Introduction by Sarah Abed: The fingerprints of U.S. imperialism can be found all over the manufactured insurrection in Syria, in keeping with the ultimate goal of destabilization and eventual “regime change” through fomenting a sectarian “civil war”. Original article written by State Of The Nation. 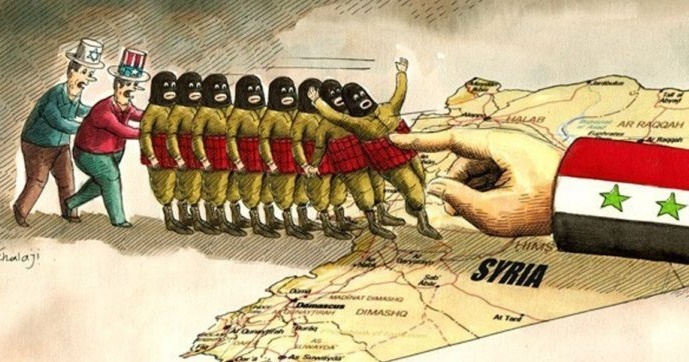 Why is the Syrian President relentlessly demonized by the Anglo-American Axis? Just like President Vladimir Putin of Russia, Syria’s President Bashar Hafez al-Assad has been the victim of unrelenting character assassination and false reporting by the Western Mainstream Media (MSM). Many of the MSM outlets throughout the Anglo-American Axis (AAA) have published one false story after another in a concerted effort to turn the entire world against him. And for what? Why are they so determined to overthrow one of the very few righteous leaders in the Middle East? The Israeli-Franco-Anglo-American power-brokers, who have controlled the destiny of most of the Middle Eastern nations for decades, have entered a new and desperate phase of conquest. Unfortunately for the entire Mideast, that desperation manifested as the fomenting of a number of revolutionary Arab Spring events. The resulting widespread death and destruction reflects just how determined the AAA is to advance their misguided agenda. Whereas each of these engineered protest movements was initiated by the agents of the AAA, not all of them were entirely successful. While the CIA, MI6 and MOSSAD may have most of the Middle East hardwired by way of information technology, many of the indigenous peoples still remain off their grid, to varying degrees of course. Nevertheless, they still expected Assad to simply resign after so many other countries had succumbed to the CIA-directed Facebook revolutions and civil wars via Twitter. President Assad, they have come to find out, is a completely different kind of being. Not only is he not of their ilk, his very presence on the Mideast geopolitical chessboard causes them great consternation. Why? Because President Assad has a conscience in contrast to the many other leaders who clearly govern without any conscience whatsoever. Of course, the AAA leadership has demonstrated time and again that it operates without any discernible conscience. So devoid of a moral compass are the American, French, and British invaders that Assad’s continued leadership makes them all look bad … VERY BAD. Hence, their compulsion to demonize him at every turn. Because of the strategic geopolitical importance of Syria, the AAA can no longer tolerate such an honest peace broker or righteous leader in such a vital location and position of leadership. Most are completely unaware, but President Assad is as just and principled as they come anywhere in the world today, particularly in the Mideast. The only way that the al-Assad family was able to stay in power since 1970 (45 consecutive years) was because of the family trait for fairness and tolerance. There are various reasons for President Assad’s popular government and respected leadership style among the Syrian people. Four of these have become particularly invaluable during this time of great trial and tribulation for the nation. Without the following key relationships and forms of mutual support in the life of President Assad, it would have been unlikely that he could have lasted this long. Therefore, none of these vital associations should be underestimated in any way. First and foremost there is Bashar al-Assad’s unwavering dedication to his family’s spiritual traditions and religious faith. Being an ardent practitioner of the Alawite religion like his father and forefathers before him, Assad has drawn great strength from this mystical and tolerant branch of Shia Islam. He went into the medical profession and trained as an ophthalmologist because of his desire to serve the Syrian people. Also known as Alawis, Alawites “are a prominent religious group, centered in Syria, who follow a branch of the Twelver school of Shia Islam but with syncretistic elements.“ Because his religious community had suffered religious persecution and many other indignities over generations prior to his father’s presidency, he is quite sensitive to the need for religious tolerance. Particularly within the context of Syria’s historical religious diversity, did the Alawites rise to provide the cohesive leadership necessary to maintain the peace and mutual acceptance? This remarkable achievement occurred over decades when many neighboring nations suffered the fate of one failed government after another. For those who are cognizant of the well-known Hindu religious tolerance in India, Alawites are quite similar. They not only believe in reincarnation as in the East, they have also absorbed many other aspects of the predominant religions in Syria especially those found in Islam and Christianity. Because of their syncretic approach in both philosophy and practice, Alawis have evolved into a genuinely tolerant spiritual community who actively cultivate a climate of mutual respect. However, it is the mystical aspects of their spiritual practice which has earned them the respect of the Syrian people. Because they are known to walk their talk, they have been trusted to lead as they have done for almost 5 decades. Alawites consider themselves to be Muslims, although some Sunnis dispute that they are. Alawite doctrine incorporates Gnostic, neo-Platonic, Islamic, Christian and other elements and has, therefore, been described as syncretistic. Alawite beliefs have never been confirmed by their modern religious authorities. Alawites tend to conceal their beliefs (taqiyya) due to historical persecution. Some tenets of the faith are secret, known only to a select few; therefore, they have been described as a mystical sect. The final point here is that the people of Syria were quite content to be governed by a disproportionately smaller number of Alawites throughout government. In spite of an overwhelming Sunni majority, the arrangement worked out well even while there was so much conflict in countries all around them. However, Assad knew that the very delicate balance of power could be upset at any time. And so it would be … by those powerful AAA nations who would deftly utilize their divide and rule MO whenever it suits their geopolitical purposes, especially their pursuit of oil reserves. As is often the case, the Assad marriage reveals how a strong woman often exists behind every great leader. In the person of his regal and supportive wife did Bashar Assad find the perfect “power behind his throne”. From a strictly political standpoint, she was raised in a powerful Sunni family which endeared her to the Sunni majority of Syria. 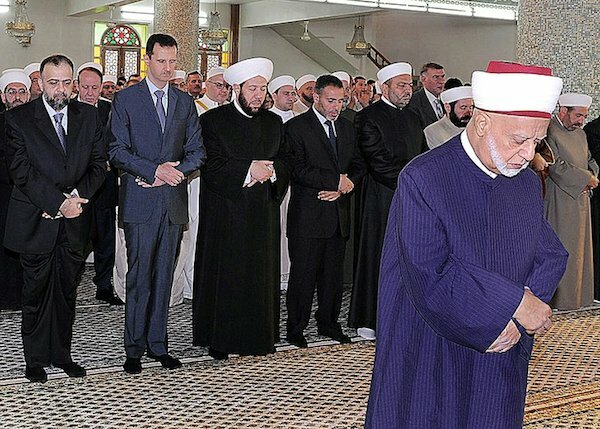 Because of his choice of a Sunni wife, President Assad was seen as a leader who sincerely lived his authentic acceptance of every religious orientation found within the boundaries of Syria. Asma al-Assad’s professional relationship with her husband was especially exemplary for the woman of Syria to see and experience. She not only sought to help liberate her gender all over the nation, the First Lady also served as a glowing example throughout much of Islamic society. Her various unprecedented and courageous initiatives to spread enlightenment and empowerment in every sphere of Syrian life were recognized by many for their efficacy and magnanimity. Asma al-Bashar has occupied a unique position in the highly patriarchal societies of the Middle East. To be presented side-by-side with her husband in her capacity of First lady, as she often is, has provided the male-dominated Arabic and Islamic culture with a new model of leadership. While President Assad is obviously in charge, he has given his wife a special role in the Administration’s various mandates to address a whole host of social, cultural and religious issues. Post “Arab Spring”, Asma al-Assad has taken on much greater responsibility because of the epic disaster that has been left in the wake of the manufactured civil war by the Western powers. The Franco-Anglo-American machinations, which produced this terrible tragedy, have posed formidable obstacles for President Assad and his wife. The warmongering has been so relentless and intense that only by the “grace of Allah” has the Syrian First Family weathered one harrowing storm after another. The loyal and genuine support from the Syrian people, which the Assad family has enjoyed for nearly 5 decades, began with Hafez al-Assad. This was a man who is considered to be one of Syria’s greatest sons having taken power in a bloodless coup during a particularly delicate and volatile period of Syrian history. Had he not taken such a decisive stand at that critical point, Syria could have easily erupted into a full-blown civil war driven by religious strife. Assad’s rule “began with an immediate and considerable advantage: the government he displaced was so detested that any alternative came as a relief”. He first tried to establish national unity, which he felt had been lost under the leadership of Aflaq and Jadid. Assad differed from his predecessor at the outset, visiting local villages and hearing citizen complaints. A humble and practical leadership style is what distinguished Hafez al-Assad from the beginning of his presidency. Although his son Bashar was trained as a physician who had no political aspirations, he followed in his father’s footsteps quite naturally. Trained as an ophthalmologist, Bashar had the sensitivity and temperament of a very reluctant leader at first. However, he quickly realized that he could not shirk the solemn responsibility which destiny had brought to him and his wife. Because of his egalitarian approach to governance and genuine concern for the cohesion of Syria, he was quickly accepted by the people as an ideal replacement for his father. The Syrian people especially embraced his socially dynamic and progressive wife Asma and received them with open arms. They became an exemplary power couple who were admired for their genuine dedication to the interests of every Syrian citizen. It is especially the Assad family’s extraordinary religious tolerance and their cultivation of a truly ecumenical atmosphere throughout all of Syria that has set them apart. When compared to most of the other Muslim Arab countries, Syria has experienced a high degree of acceptance and camaraderie among a diverse number of religious communities. This critical personal and family inclination toward religious tolerance has been actively translated into public policy; subsequently, all of Syrian society was distinguished by its remarkable religious tolerance and mutual acceptance. The following excerpt quotes Asma al-Assad from an interview conducted just before the recent civil war was instigated by the Anglo-American Axis. This revealing and laudatory article was quickly removed from the internet by its publisher because of the positive portrayal it painted of the Bashar family, particularly that of Asma’s enlightened stewardship. Russia has been ardently opposed to all of the bellicose meddling in the internal affairs of sovereign nations. President Putin has stated on numerous occasions that there needs to be a new global platform of international relationships built on the foundation of implicit respect for national sovereignty. He has expressed that the world community of nations is obligated to reject the outside interference of those powerful nations which routinely commit actions of naked aggression. In fact, Russia, China and India have repeatedly singled out the USA and UK for their outright interference in the affairs of countries large and small, rich and poor. Toward that end, they have proclaimed their support for Syria’s only legitimate government under Bashar al-Assad. 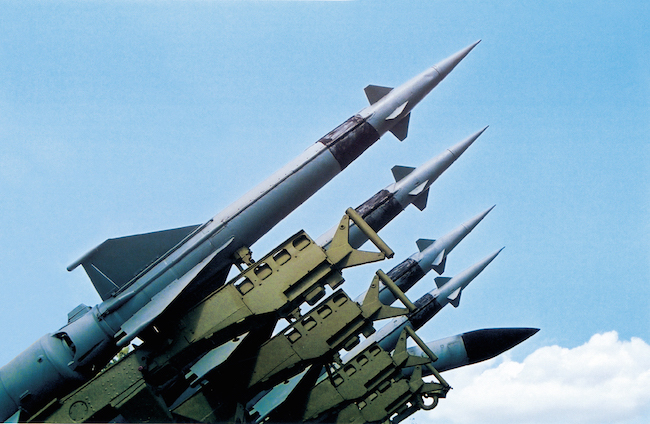 Putin has even supplied Syria with sophisticated weaponry which he would only do in the case of unprovoked acts of aggression being systematically being perpetrated against the Syrian people. The AAA does not yet understand the seriousness of the war crimes that they have committed in Syria. Each act of violence against the people and their property has been recorded. Every act of wanton destruction and needless killing has been cataloged for the purposes of accountability. Russia and their allies are watching the conduct of ISIS and how they are supplied and financed. It is common knowledge that the Israeli-Anglo-American intelligence services have coordinated the attacks on Syria from the very beginning of this manufactured civil war. At the end of the day, the AAA will be held responsible for their actions and inactions which directly contributed to this terrible tragedy. The Syrian War has created the greatest European immigration crisis of the modern era. Should the AAA continue their imperialistic designs against the Assad Administration and the people of Syria, they will bring upon themselves the wrath of the Russia bear. The primary geopolitical strategy employed by the Anglo-American Axis over the past 100 years throughout the entire Middle East has been that of divide and conquer. Using the intelligence agencies and secret services of Israel, the AAA has been able to sow seeds of discontent among the Sunnis and/or the Shiites in any country its wishes to control. The fabricated revolutions and fake protest movements of the Arab Spring are perfect examples of this outright subversion in action by the AAA. As always, the AAA leadership has cynically incited these religious rivalries in Syria, which have existed for centuries, between the Sunnis and the Shiites, and between the Christians and Muslims. There have been many instances where Sunnis and Shiites have been able to peacefully coexist. Nevertheless, a well-timed false flag attack or assassination can quickly undermine that peace. How many times has a single MOSSAD-trained suicide bomber turned a town or community into a conflagration? When the balance of power is forever tipping to one side or another, it is very easy for outside forces to destabilize any nation with significant Sunni and Shiite populations. Even when one or the other exists as a small minority is the divide and rule strategy employed with great effect. In this manner has the current civil war in Syria been fastidiously engineered by the AAA and it many proxies. After stoking the flames of the long-burning fire of religious differences outside of Syria, they have been methodically exported into that country. In this fashion has the whole nation been turned into a slow-motion holocaust. President Assad is well aware of the wily and subversive ways of the Western powers. The USA, France, Great Britain and Israel, in particular, have revealed their seditious agenda from the start of the Syrian Civil War. Despite the utilization of every stratagem in the CIA playbook, the AAA ruling cabal has been unsuccessful at toppling Assad. Such is the allegiance of the Syrian people to their leader who was thrust into the presidency more by fate than by the typical dynastic designs. What really happened in Syria since 2011? Syria is one of those extremely unfortunate countries that is located in the wrong place at the wrong time. For the uninitiated, any nation that occupies a highly strategic position on the global geopolitical chessboard is vulnerable to AAA-instigated acts of aggression. Syria is not only in the middle of a region that possesses valuable oil and gas reserves, there are those who would like to control their transport over Syrian soil. Syria has also enjoyed the support of Russia and Iran throughout the many unlawful attempts by the AAA to violently overthrow Assad’s legitimate government. Russia’s Mediterranean naval facility in Syria located at Tartus provides Moscow with a vital base from which to deter other illicit acts of AAA aggression in the Mideast. President Vladimir Putin’s recent decision to put a Russian military footprint on Syrian soil is an indication of his commitment to Assad’s continued leadership role. For it is certain that any USA-chosen presidential replacement would surely terminate Russia’s naval base lease, thus depriving them of an essential deterrent to Western warmongering. Bashar al-Assad’s independence has long been viewed with suspicion by the AAA leadership, which was tolerated until 2011. Under Hillary Clinton’s State Department were the plans hatched to unleash the CIA-directed Arab Spring on Syrian soil which was ultimately directed at overthrowing Assad any way they could. However, the stubbornness of the righteous regime in Damascus was grossly underestimated as the conflict approaches its seventh year. The Western creation of ISIS stands as a glaring testament to how desperate the USA & Company is to control every square inch of the Middle East, especially the oil and gas reserves. 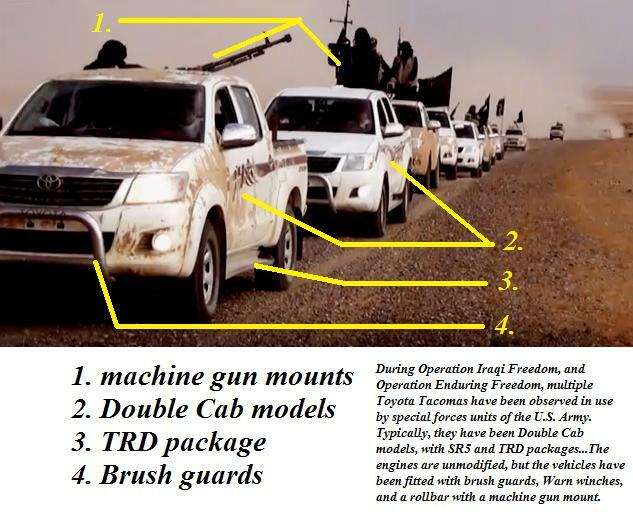 Not only were billions of dollars in armaments and munitions intended for Iraq surreptitiously sent to Syria, fleets of brand-new Toyotas have been paraded all over the ever-changing battlefield reflecting direct Western involvement. In fact without Western war financing and weapons supply, ISIS, ISIL and the Islamic State would have already collapsed. Isn’t it strange that “ISIS” just happens to be pictured along with a convoy of Toyota trucks that at least appear to be modified the exact same way special forces has them outfitted before shipping them from the factory in Texas? When you combine this latest discovery with the fact that “ISIS” has (i) U.S. military small arms (ii) U.S. military Humvees (iii) U.S. military artillery (iv) U.S. citizens running their online social media campaigns (v) John McCain met with destabilization campaign terrorists in Syria including someone from the newly formed “ISIS” in March of 2013… what conclusion would a reasonable person come to? The following graphic well describes one of the primary purposes for the deliberate engineering of the Syrian War by the Anglo-American Axis. Syria has provided support to Israel’s sworn enemies for too long. The Golan Heights remain a highly contested region that Israel illegally seized during the 1967 Six-Day War and unlawfully annexed in 1981. That universally condemned theft of Syrian property was part of a much bigger agenda to establish a “Greater Israel” which would quite substantially expand its current borders … always through illicit acts of war and unprovoked aggression. Israel’s security ‘will not’ be compromised, nor will its expansion into the “Greater Israel” be impeded. However, in the leadership of Bashar al-Assad, the rogue nation of Israel has met its match. Assad’s Syria has fought valiantly against the greatest military forces on Earth and somehow prevailed when it should not have. While Syria had sustained big losses of territory to ISIS in the first few years of the war, this war took an interesting turn when Russia showed a serious military commitment on the ground. Since then substantial progress has been made by the axis of resistance. 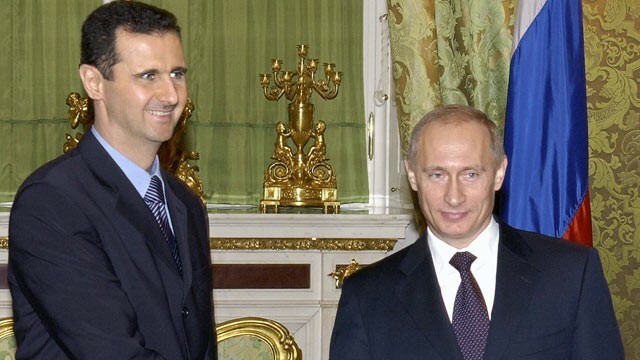 Lastly, the relationship that exists between Presidents Putin and Assad completely transcends geopolitical objectives and military purposes. Both have an abiding respect for each other’s religious orientation. Under Assad, the Christian communities throughout the Middle East could always expect to find protection and support. The Russian Orthodox Patriarchate in Moscow certainly appreciates this historical fact of life under Assad’s stewardship. Syria had always been a safe place for Christians to live side-by-side with Sunnis and Shiites, Alawites and Sufis … in peace. Only if Bashar and Asma al-Assad remain in their seats of power and influence will there be any hope of a return to that unique and once-enduring peace. This is the real reason why the AAA aggressors have been unable topple Bashar al-Assad — the grateful people of Syria simply won’t let them. The most effective way for the AAA to bring down any leader of international stature is to falsely accuse them of committing unspeakable atrocities against their own people. In this way the MSM has regularly been used to disseminate patently false stories about Bashar Assad. In every single case of a ‘gas attack’ it was obvious that the U.S.-backed rebels were doing the gassing; that is, if any gassing was done at all. Some of those ‘heinous attacks’ against Syrian citizens have been proven to be staged events choreographed by the MOSSAD et al. In each and every case that a chemical gas attack did occur, it was a false flag operation conducted by the CIA-backed rebels. When the false flag attack was obviously staged, it was coordinated by the same MOSSAD-assisted rebels. Assad himself has conducted interviews in which he categorically denied any such attacks against his people. Those who know him have all said the accusations are as contrived as they are ridiculous. Syria has since turned over all chemical weapons for immediate disposal. For the unaware, the Anglo-American Axis is well-known in intelligence circles for carrying out chemical attacks whenever they want to demonize a government or political leader. Nothing rallies the world community quicker than a fake cause concocted with fraudulent news reports about chemical weapons used against an innocent civilian population. In the meantime, the United States of America maintains the largest stockpiles of chemical and biological weapons in the world. And, for what purpose? In fact the AAA is now notorious for routinely alleging ‘war crimes’ and ‘crimes against humanity’ whenever it serves their geopolitical goals. Their simple MO is as follows: First they send in their proxies to commit some form of brutal violence; then, the foreign government reacts strongly to appropriately protect people and property. This is usually where a ruthless false flag attack is conducted that is falsely blamed on the sitting government, just like the CIA did with the Kiev shootings during the Maidan protest. They executed the same type of false flag attack with the shoot-down of MH17 over the eastern Ukraine. An excellent article Sarah. Long live President Assad. Long live Syria. A good article, honestly written. A very good effort, but I think incorrect in a number of ways. 1. The Arab Spring protest movements took the West by surprise. Those were fallout from Wikileaks publication of the State Department cables. If you recall, the “Arab Spring” started in Tunisia after publication of cables that had the American ambassador talking frankly about the corruption of the ruling party. Some naive techno-idealist journalists in New York named it, “The Arab Spring” and the name stuck. They ran to Egypt with great enthusiasm, reporting on it as the great doing of Twitter and texting. The world was changed by technology! Silicon Valley was remaking the world and the people were rising up to make the world right! After that, I think there was a decision to co-opt those movements that overtook Libya and then Egypt. Obama didn’t really want to go into Libya, which is why he kept it to bombing support. But, he was pretty much the doormat president for the 1%, and bent with the whims of the mass media. Look back on the naivete of the New York journalists (New Yorkers were the leaders) who covered Cairo and its aftermath. In that mix, Qatar’s Al Jazeera fanned the flames in nations the Wahabbis didn’t like. Nice liberal journalists are not terribly bright most of them, and they have a herd mentality. Syria had a small rebellion that from my understanding was initially exacerbated by the same phenomenon that turned Russia, and then China and Cuba communist. Economic reforms and inequality. Correct me if I am wrong, but Assad had done most everything the Western economists told him to do. Took down trade barriers. Went for globalization. For the peasants, a lot of whom were Sunnis, this created worse conditions in an already difficult existence. For the city folks, just like in Russia and China before those communist revolutions, there was improvement of living conditions. What peasants in such crisis do is turn to a revolution that will give them something. Land. A fair shake. Islamists provided that, and were, at least initially, culturally compatible. Enter the USA and Hillary Clinton, who never met a war she didn’t like. She decided that Assad should be overthrown. She appeared quite gleeful about it. In Hillary’s world a woman isn’t really a power in the world until she commands armies to conquer. She doesn’t put it like that, but it’s written in everything she did. I think a lot of that was Israel’s wish. Netanyahu claimed that removing Saddam Hussein would create great improvement and bring peace. 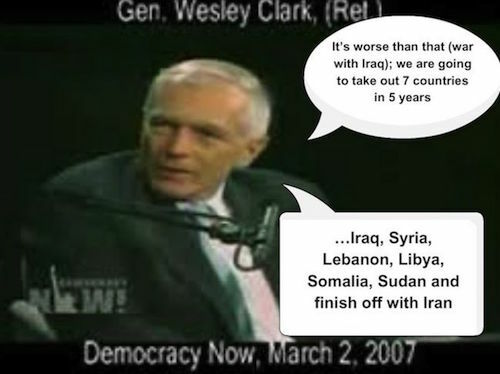 He was totally wrong, but that hasn’t stopped that idiot from doubling down and pushing the same for Syria. Netanyahu has domestic political cunning, not brains. The other party was the Saudis who want Assad gone because he’s a successful leader who runs a poly-theistic coalition in the Middle East. And as you point out, Assad is an Alawite, a member of a sect of Islam that is, perhaps, the antithesis of the Wahabbi conceit. The Wahabbis hate him for both his “perverted heretic Islam” and for being so successful. To them, Syria is as bad as Israel is, maybe worse, because their own people could look to Syria and say, “We want that,” but the people of the Gulf will not decide to be like Israelis. Assad and a successful Syria are an offense to Wahabbis conceited ideas of religious correctness and their idea that they are the only true Muslims on earth who must correct everyone else. Because if there is a god/allah that is real, and it is their version of allah, then there should not be people like Assad being successful. So he is an offense to them like Israel is an offense. 2. You are quite correct about the Assads and tolerance. But I don’t know if you appreciate just how stupid journalists in the USA are as a class. I have seen it for a long time now, since the rise of Hafez Assad and then his son. The typical American journalist is someone who chose that major in college because they couldn’t do math, and couldn’t do science, didn’t care for history because it requires a lot of study, and needed to do something. They are not the sharpest tools on the table by far. And many have a chip on their shoulder. They know they aren’t as sharp as others, and resent people who are smarter than they are. It is visible in how they don’t research stories, and make stuff up. So, in the USA, when Hafez Assad leveled Hama, this was a massacre, disconnected from events. In the American journalist’s mind, war “breaks out” like a meteor striking the earth, or influenza. There is no history. There is no cause, it just “happens” like a thunderstorm, or bird flu. So, very few people know about the 9 years that Hafez Assad bent over backwards and tied himself in a pretzel trying to bring the Muslim Brotherhood into the political process as a party. They responded to his last gesture of freeing most of their prisoners by trying to kill him and killing a bodygaurd and friend. This needs to be clearly understood about America and our journalism. It’s garbage. It has always been garbage except in rare instances, and you can find this through our history. American journalism is ahistorical drivel written by rather thick, mostly rather petty and ignorant men who, in my experience, usually prize their ignorance and think it is some kind of qualification that allows them to write, “without prejudice”. They really think this. This ahistorical mind-set then pervades American culture, except in limited instance for things that happen inside our country. Only when the journalists who write about it were part of the history can they write semi-knowledgeably. They write knowledgeably about events here, because they have no choice lest they be laughed at. But Americans in general don’t care about history much. This is our strength, because we don’t carry a large burden of the past with us. It is also our Achilles heel, because most don’t know and don’t particularly care about the past. Our culture wants to look to the future. You get all of this without adding any conspiracy by the CIA or people in our State Department yet. In America, politicians rarely lead, they are led. They are led by our media to a huge degree. And sometimes they lead us into war in order to manipulate our media, as I believe happened with Bill Clinton and the Kosovo war. I believe he did that, quite cynically, to stop the media talking about Monica. Since the mass media is made up of editors and journalists with roughly the attention span of chickens, it worked like a charm. 3. A minor note. Hindus are supposed to be tolerant. But there have been many riots and Pakistan and Bangla Desh were created to separate Muslims from Hindus to quell the violence. That violence has roots in the Mogul conquests. To this day it rankles Hindus that their greatest temple is now a mosque where the stela is broken and lies at the center, cast down on the dirt, a symbol of Muslim dominance. And Sikhs started as a radical pacifist faith, like Jains. But their guru Nanak finally told them they must fight back when attacked because of the muslim invaders. This is why they have the last name of Singh, it means lion and comes from that time. Even Buddhists have their limits when attacked. Visit Thailand to see how a Buddhist warrior culture survived intact against successive waves of invader armies. 4. I think that the way that the USA and Britain and France decide to use jihad is simpler than you think. It is even more cynical than you believe, and in the middle east, not as organized as you think. What we see in the early days of the Trump administration is, in part, a squabble within the dinosaurs of our foreign policy people about whether Russia or China is the top enemy to defeat. Tillerson thought he would talk tough to China. The Pentagon’s response was to order its ships to a location 1500 miles away. China has tied Tillerson in a cocoon of silk he cannot move in and he knows it now. Which is good for the world’s peace. The administrations in the USA don’t really see Islamists as real enemies. They see them the way Edward Snowden described them. Snowden called them, “A few disorganized Arabs.” This was one of his justifications for his leaks. What you see there is that Snowden, without thinking about it, absorbed the USA defense agencies real thinking about ISIL and Al Qaeda. It’s an idea that they are really so small that they aren’t worth going after. And yet, as I criticized Snowden about this, those few backed up the Pakistani army until they were 90 miles from the capital. Without the US drone war, they would have taken Pakistan and achieved their goal. The Islamists want nuclear weapons. That is what 9-11 was about, a provocation to galvanize their people to war. The USA is really quite stupid about this sort of thing. We look at those people and see stupid hillbillies. We don’t realize that they are poking us deliberately to do what they want in order to achieve their goals. And so, repeatedly, we see US presidents using Islamists and giving them weapons. Israel is in favor of this too. At least the idiot Netanyahu administration is in favor of it, and has convinced enough Israelis of his utter nonsense to stay popular. This is a problem with Israel, just like it is in America. Domestic politics helps a leader who spouts utter garbage but demonizes other nations. For Israel,, Syria has supported some Hezbollah attacks and warfare. This is fact. Syria was pretty good at it. But the cures are utter idiocy. Even after the complete failure in Iraq, the morons are still saying the same thing. And they think that Arabs killing Arabs helps Israel because it makes less Arabs. This is lunacy because it pretends that there are no births. What is really going on is Arabs become better at warfare by evolutionary steps. It is not that most want war, most don’t. But forced into war, people and cultures learn it better. Israel is sharpening the swords of its enemies. Sharpening their skills. 5. This brings us to the demonization of Putin. If you recall, this was not nearly so much until after the Ukraine revolution, and in the Trump administration has raised it to a fever pitch. That is, just like in Israel, demonization mostly for the sake of domestic politics.. Hillary Clinton and John Podesta decided the day after they lost the election to blame it on Russia. I don’t think they actually believe it. They are just so arrogant and pig headed that they think it will be the way to win in 2020. And Hillary Clinton intends to be the candidate for the Democrats again because she thinks she should have it. She’s like a spoiled child that way. 6. Oil. Yes, what you say is true to some extent. But I don’t think many actually believe that US companies will make much money from Syria. It’s more mental inertia in our political and public servant class combined with a relative handful of bad actors who want war with Russia. The sons and daughters of Brzezinski are working hard on getting war with Russia to happen. Syria is a side show there. It’s a war of convenience for the Brzezinskis and their allies within defense. The base at Tartus is an offense to that crew. And they are allied with the defense contractors who make billions from supplying the support infrastructure for our wars. Those guys need war, any war, anywhere, to stay in business. For civil servants and politicians who mostly don’t really give a damn either way, it’s easier to bow down and go with the flow of war. Stick your head up, it gets cut off, you know? So, they go along.